Last week, I introduced you to two awesome business concepts that translate well to personal finance – the SWOT analysis, and the executive summary. In today’s third and final part of my series, I’ll apply another well-known business plan staple to our home money – the profit and loss table. A disclaimer of sorts before I get into the details–I am good with numbers, but I am neither an accountant, nor a lawyer or business specialist. My “analysis” of a profit-loss table is limited to my vague understanding of business accounting and focused on the application of the principles to personal finance. Whew! 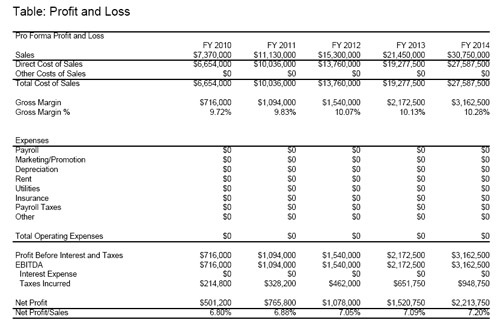 Okay, with that out of the way, let me define what I think a profit and loss table shows in simple terms. Long story short, a profit and loss table takes your total sales, subtracts the cost of those sales, expenses, interest, and taxes, and shows you the final net profit (your “bottom line”). which shows how much the company will make every year. In business, this deceptively straightforward table allows a quick overview of the projected financial state of the company over the next X-number of years (1, 3…maybe 5). How much are we going to bring in, how much is it going to cost us, and what can we take home at the end of the day? Can you begin to see the usefulness at home? Let’s dig further and fill in the first column. This can either be a projection for the next 12 months, the current calendar year, or the last 12 months. I have found that historical data works best as a starting point. In either case, I strongly suggest using a one-year time frame to get the broadest overview. Sales – This is the amount of money you bring in by selling your product or service. If you are a traditional employee, your sales essentially equal your salary–what you make in exchange for your time and/or skills. Cost of Sales – If your business sells widgets, this would be the cost of producing that widget. Can you attribute any expenses directly to your salary? I would–taxes and student loans, for example, as well as transportation costs to and from the office, continuing education, business lunches, etc. Basically–anything that would not be spent if you weren’t working. This “direct cost” is also useful if one member of a couple is thinking of becoming a stay-at-home parent. Gross Margin – Your gross margin is the amount left over after you subtract cost of sales from sales. Taking your income and deducting taxes and your other expenses will yield what you have left over–your gross margin. This is everything available to spend and save. It’s also useful to calculate a percentage here for easy comparisons year-to-year. Do this by dividing the gross margin into your income, then multiplying by 100. Expenses – While the other parts may seem easier, this section will probably take the most time. First, you’ll need to obtain accurate budget data or take best-guess estimates. Second, I would suggest no more than 10-15 categories in this section to make the most of this “overview,” so some consolidation may be necessary. Lastly, you’ll need to convert monthly expenses to yearly, and determine irregular expenses in your budget. Line-item everything and then add it up to get your total expenses. Profit Before Income and Taxes – In a normal business table, at this point you would have your your gross profit, and subtract interest expenses and taxes. However, at home you have your tax taken out on what you make, not what you keep, so that’s why we included it in the cost of sales. Additionally, your interest expenses are typically swallowed in a category like “mortgage” or “debt,” so don’t worry about those. Net Profit – This is the amount of money left over after you subtract all of your expenses from the gross margin. It should be positive, indicating your have money to save at the end of the year. If it’s negative, you’re probably living beyond your means. Another percentage calculation is helpful at this point for later comparison, dividing the net profit into sales. Once your first column is in place, the benefits of the profit and loss table really start to kick in. Now we get to fill in the rest of the table! Take a good look at your current-year column. Is this your ideal financial situation? Are there things you would change? Of course! If you’re like most people, you’d love to make more money, cut expenses, and save more. Here’s your chance to make that fantasy into reality–where can you realistically (but aggressively) hope to be in five years in terms of income, expenses, debt, savings, etc.? It may be helpful to pull out your SWOT analysis at this point, and especially your executive summary. They are true guiding lights to your target. Develop that dream and write it into the column that represents Year 5. That is your target profit and loss in five years – your mid-term goal. Now you have your beginning (where you are now) and your end (the five-year goal). The next logical step is to fill everything in between. Do so on a straight-line (steady growth/reduction over 5 years), accelerating-curve (increasing growth over 5 years), or decelerating-curve (slowing growth over 5 years). If you have specific benchmarks or opportunities in mind, account for them. Remember that the two biggest benefits of this analysis are concrete goals and benchmarks for the next five years, and the broad overview you get by looking at your income/expenses on a yearly and consolidated basis. The way you use your finished table is up to you–but it makes sense to review it regularly and to review it once a year when the time comes to compare actual progress to projected estimates. One thing I would advise against is revising the table. Use exceptional progress to feel good about how you’re doing! If you’re behind, use it as extra motivation to kick things into high gear. Everything I’ve given you over the last two weeks is a tool – customize it as you see fit and use it to your advantage. You’ll reap the most benefits that way. Good luck! I put together a P&L statement every year for my home business. Since that is our primary income, it mostly applies to our personal finance as well. I like the idea of looking at everything, and seeing where it is all going. Hi Miranda! Great point–if you already have a home business, this isn’t really a stretch for you. For those of us working outside the home, it takes a little bit of getting used to. Great post, Wojo. As you know, the mantra at my site – and in my home as well – is to treat your household like a business. And a P&L table is a great tool for household strategic planning. Great advice about not revising the table, too. Although I do have to say, if things start to get too out of whack and then stay there despite your best efforts to correct them, then perhaps your projections may have been just too optimistic (or pessimistic, as the case may be) and thngs will need to be tweeked. I agree, Len–sometimes the only option is to revise. But too often, I think we just use the flexibility we give ourselves to make it look like we’re doing better than we actually are. If you’re honest with yourself and keep your eye on the goal, I don’t think you can go wrong. Nice one Wojo. Sometimes it’s scary to face the truth about how much in losses we have, so we don’t do it. If we can highlight the losses, we can highlight the problem and fix it. Acceptance is an absolute must with your finances! I think we have to face our downsides just as much as our strengths and deal with it. A very informative article. Small business owners should use this concept and not be afraid in knowing their losses. This will encourage them to make the necessary adjustments so that their business become profitable.